The writing of this manuscript was apparently completed in 1458; at the start of the volume is an inscription recording that William Ebchester, Prior of Durham Cathedral, had it made. 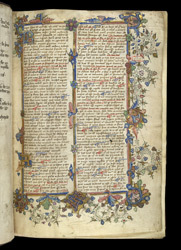 The first page of the text is framed by a full border of gold, pink, and blue bars, from which sprouts foliate decoration. The script and decoration are not particularly high quality, and the initials are no larger than those in the rest of the volume, suggesting that this was never intended to be a book of the greatest luxury. The brown ink inscription in the top right corner is a Durham cathedral press-mark.